Raise your hand if your favorite librarian is a weigh-lifting Mormon with Tourette Syndrome. 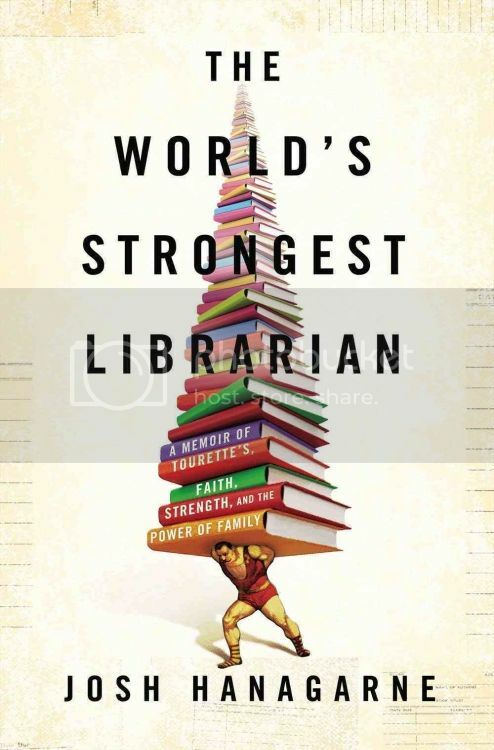 Then clearly you have not yet read Josh Hanagarne’s memoir, The World’s Strongest Librarian. Josh Hanagarne is the 6’7″ librarian working for the Salt Lake City Library. Between his height, his Tourette’s, and the fact he is a weight-lifter, he isn’t exactly inconspicuous. The World’s Strongest Librarian is a bit of a catch-all memoir, encompassing everything from Hanagarne’s family, to his faith, to his attempts to overcome his Tourette’s. Hanagarne has a fascinating story and he tells it with a fresh and extremely engaging voice as his love for books intertwines with his attempts to literally (and I swear I’m using this word the correct way here) be stronger than his disease. Readers won’t be able to help but to become involved in Hanagarne’s story, told as it is with wit and wisdom. Recommended. I just finished reading it. Working on my review, but I really enjoyed it. it’s the kind of book you can recommend to so many different types of people for different reasons. I have it! I have it! I’m going to read it ASAP! I didn’t know this was a memoir. Told with wit and wisdom? Sounds good! It’s in my June pile and Farin talked me into it because I don’t normally do memoirs. Yes, I loved this one too! I’m going to add your link to my review.